Ratur (Arthur Maslard) was born in Le Havre, France in 1983. 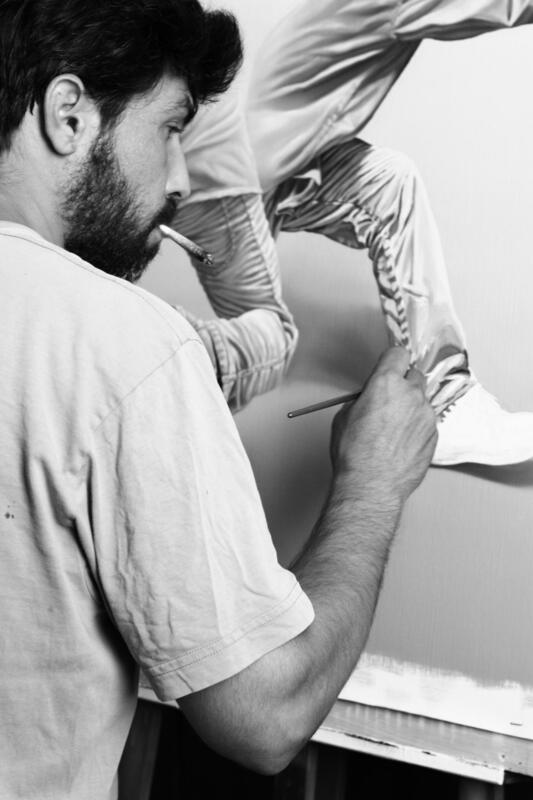 He is a painter, graffiti artist, graphic designer and a muralist. His participation in various street art festivals and exhibitions in Europe and the United States is gradually pushing him towards an international career, along with his brother Sckaro (also represented by 19 Karen), whom he collaborates and exhibits with frequently. The hyper realistic work of Ratur examines the relationship between graffiti and the old ‘traditional’ masters. His influences include classic painting, graphic design and graffiti and you can see traces of each in his work. His characters, who always seem to want to remain anonymous, are depicted in a very contemporary way. Despite his realistic approach, he does not seek to reproduce reality. Ratur was born in Le Havre, France in 1983. Attracted by drawing and graphic arts, in 2001 he attended a visual communication school, where he met graffiti artist Madkow. A few months later, the two paint their first mural and found the MV3 collective with Ratur’s younger brother Sckaro. Freelancing since 2007, Ratur works primarily in graphic design and illustration, but never dropped sprays and brushes. His participation in various street art festivals and exhibitions in Europe and the United States is gradually pushing him towards an international career. The hyper realistic work of Ratur examines the relationship between graffiti and old masters. His European influences revolve around classic painting, graphic design and graffiti. His characters, who always seem to want to remain anonymous, are depicted in a very contemporary way. Despite his realistic approach, he does not seek to reproduce reality and plays with different graphic treatments on successive planes and the depth of field. The hand, omnipresent in his work, often provides context and tells us more about the character’s intentions.